Review of Dogfish Head My Antonia | Beer Apprentice - Craft Beer News, Reviews, Interviews and Info. This beer is considered to be an Imperial Pilsner, of which I have never had, so I’m very eager to try it. 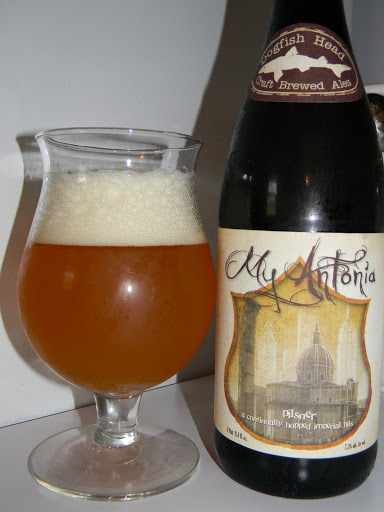 Here’s what I found out about ‘My Antonia’ from the website, dogfish.com. My Antonia started out as a Collaboration beer when Sam brewed it at Birra del Borgo (hope you can read Italian) outside Rome, Italy with owner/brewer Leonardo DiVencenzo in October of 2008. In 2010, we began brewing My Antonia here at Dogfish Head brewery in Delaware for U.S. distribution. This original 2008 batch was brewed and distributed by Birra del Borgo. A small quantity was sent over to the United States. The 2010 release will go to limited markets here in the U.S.. It should start hitting shelves by mid-late June. I’m very excited about trying this one I must say. This brew came in a 25.4 oz. bottle and had an ABV of 7.5%. It poured a mostly hazy, orangish/pale yellow color. A fabulous, rocky, white head was formed from a medium aggressive pour. It was nicely sized, slightly creamy, with some wonderful retention and more than adequate lacing. It looked very, very nice. The aroma started with pleasant bursts of orange peel. Some light lemon grass and tropical fruitiness added even more sweet, juicy goodness in the nose. It smelled perfumy with underlying hints of biscuit and grain. The citrus and fruity aspects stood slightly above the maltiness, however it continued to remain complex, fresh and harmonious. As the brew warmed considerably, I started to detect some alcohol notes deep within the aroma, although they were never distracting or out of place. The taste presented light, but refined aspects of orange citrus. A sturdy and consistent punch of hops and bitterness stayed with the beer the whole way through. It’s sweet, fruity and juicy. It seemed a touch ‘grassy’, bready and grainy, which tamed the sweetness just a touch. Maybe the smallest fraction of caramel malt right at the swallow helped out a bit too. It was evenly balanced and complex through the entire drink. Very nice and tasty. The mouthfeel was medium to a slight medium/thin. Very smooth, crisp, snappy, dry, refreshing and thirst quenching. Very good carbonation. It seemed to sparkle on my tongue. A gratifying alcohol warmth was left behind along with a solid showing of flavor. What a great beer we have here. It’s, obviously, well made and super easy to drink. Actually, quite quaffable for 7.5%. This is probably the best Dogfish Head that I’ve had thus far. It really hit the spot. In some ways it reminded me more of an IPA than a Pilsner, but either way, My Antonia was quite enjoyable to drink and would be perfect for the Spring and Summer weather. It’s, without a doubt, a beer that I would gladly drink again if I can find another bottle. If you guys see it, don’t hesitate….. pick it up before it’s gone. What’s your favorite brew from Dogfish Head? Thanks for reading and commenting guys. I hope all is well.